Is there any better way to see the trees than zipping through them? Zipline courses are a fun way to experience a destination and are appropriate for almost all ages. 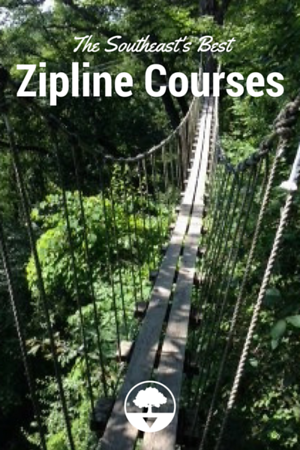 Ziplines in the South come complete with swinging bridges, obstacles, and plenty of thrills. Have we missed any? Be sure to let us know in the comments below! When getting out of your car at the lovely cove in Barnardsville, North Carolina, you know without a doubt your time in the trees is going to be beautiful. Navitat is one of the premier zipline tour groups in the southeast and has been well known in the region for years. I’ve been aware of them due to the adorable squirrel billboards speckling the Asheville area. 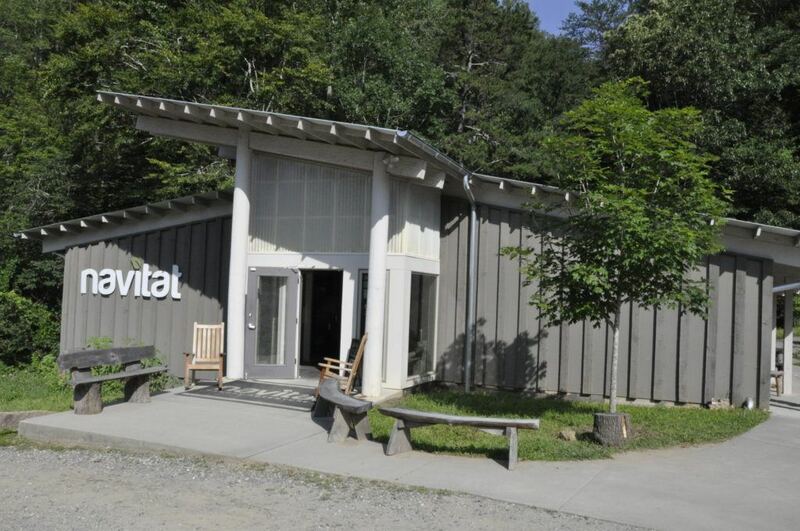 The name Navitat comes from “navigating your habitat” which hints at the ecological focus of the tour group. After a quick (and private!) weigh in we met our guides Dan and Dan (bearded and unbearded) to head to the gear shack. Guests are suited up with a full body harness, helmet, and gloves. Navitat is now completely auto braking which means guests don’t need to focus on slowing down or stopping but rather enjoying the view. After a steep and bumpy van ride up the mountain, the first zip afforded all of the Blue Ridge vistas I’d been aching for. Sprinkled along the six zip course are several bridges and platforms that allow for great views and moments of pause to take in the beauty. The Moody Cove Adventure is the original zipline tour with an ecological focus. The guides are well versed in local flora and fauna and spend time highlighting the conservation ethic of Navitat. This was reiterated as the owner, Ken Stamps, joined us for a picnic after the tour concluded. He stressed stewardship in both building of the course and sustaining its role in the community. For those more interested in an adrenaline pumping ride, the new Blue Ridge Experience reaches speeds of up to 65 mph and an opportunity for a shared zip experience as two lines fly side by side. To participate one must be between 70 and 90 (depending on the tour) and 250 lbs and be in somewhat good physical health. Longer pants are recommended for comfort and closed toed shoes are required. 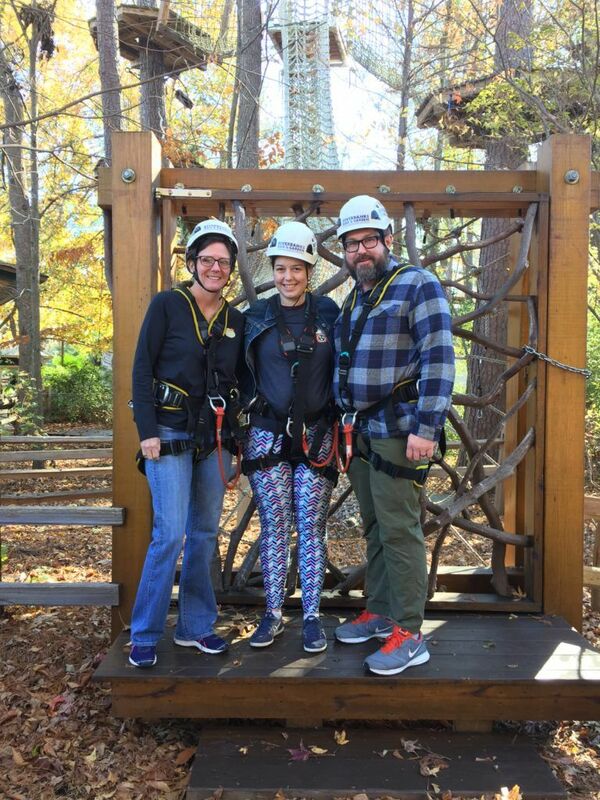 The company has both Navitat Canopy Adventures in North Carolina, which Sammi visited, and Navitat Knoxville, Tennessee at Ijams Nature Center. A former family farm, Foxfire Mountain Adventure Park is a getaway from the tourist-filled areas of Gatlinburg and Pigeon Forge , Tennessee. The 150-acre complex has a swinging bridge, America’s longest, to an area where guests are encouraged to leave their wishes on colorful strips of paper. There’s also ATV tours, a cider distillery, and climbing wall, but most come for the ziplines. You’re weighed in advance and given all the gear you’ll need. Their Goliath zip line is the longest, fastest, and highest in the area at 475 feet. Another favorite is the Waterfall Canopy tour, which soars above creeks and waterfalls. The Aerial Ropes course is better for those afraid of heights and doesn’t take quite as long as the ziplines. All zipline tours last two hours but give yourself time to look around afterward. This activity is encouraged for ages 7 and up. Keep in mind that not all of the activities are open year round. The state of Georgia has upped their game when it comes to thrilling zipline courses, especially in the Georgia State Parks. Historic Banning Mills near Carrolton is perhaps the best well known, with the title of the longest and largest zipline canopy tour in the world at 51,000 feet. Ages 8 and up are welcome on the five courses, but keep in mind that a moderate level of fitness is required, starting with a 65-foot climb. You must be 90 pounds. 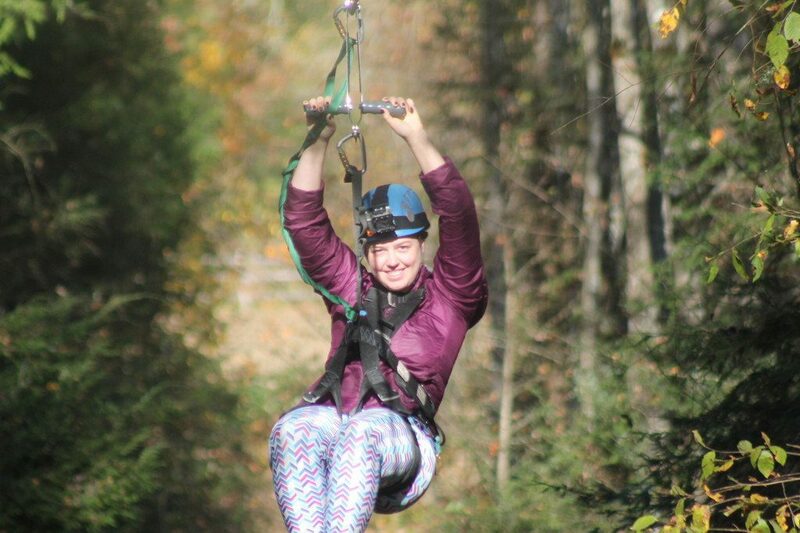 Unicoi Zipline & Aerial Adventure Park in Helen is another course operated by the same group. The two-level courses are for ages 8 and up and include skywalk bridges and towers. Not far away is Amicalola Falls State Park, which we visited for the opening of the zipline course. The park has a family-friendly course and a long zipline over a scenic gorge. 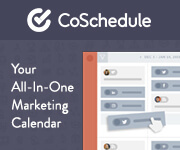 These courses use a locking carabiner technology that doesn’t require you to unclip until you reach the end. All three zipline facilities have a range of accommodations if you want to turn it into a weekend trip. While not a traditional zipline course, I was impressed with the one at Riverbanks Zoo and Botanical Garden in Columbia, South Carolina. 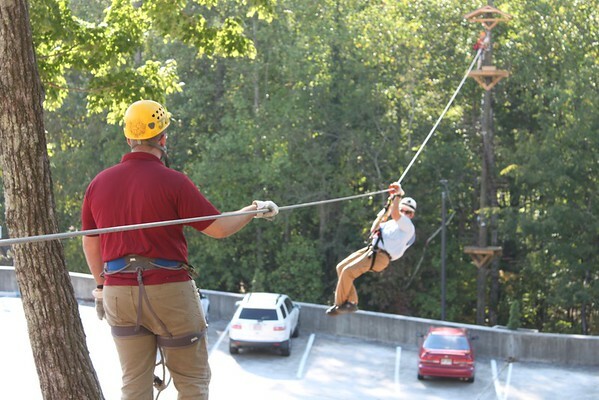 Much more than a zoo, Riverbanks has a large botanical garden, a high ropes course, and ziplines over both the zoo and the Saluda River. There’s also a package that lets you go on the zipline at night! Guests must be at least 70 pounds to go on the course. You’ll be outfitted in a full harness, so long pants or long shorts are ideal. Closed toed shoes are required. After you’ve enjoyed the trees, explore the zoo and its unique creatures. 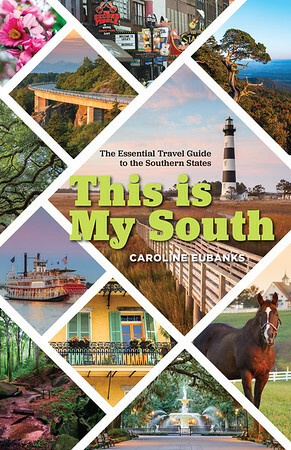 Sammi Eubanks contributed to this story. This information was gathered through press trips with Hemsworth Communications, Laurie Rowe Communications, Geiger PR, and Hawkins International PR as well as the destinations mentioned.